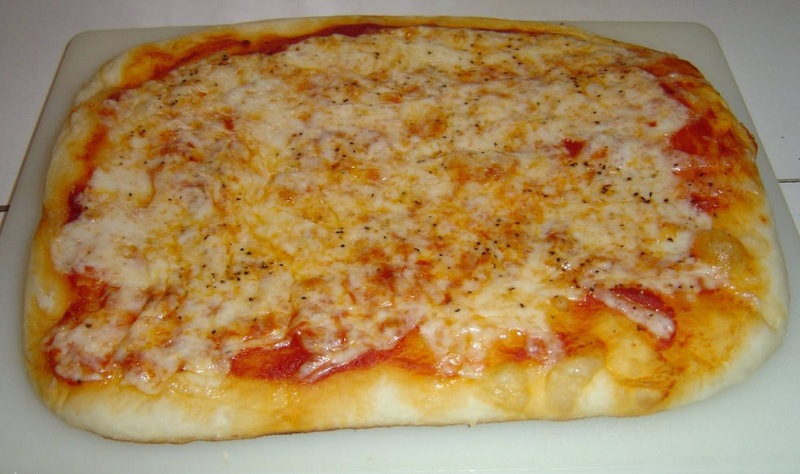 Homemade pizza is so easy to make! People often get the wrong impression that pizza dough is hard to make. They either pick up a pre-made shell at the grocery store or head for the pizza shop. I hate to burst your bubble, but homemade pizza is the easiest raised dough you can make. In fact, you can make you own homemade pizza crust in less time than it takes to get in the car and go to the grocery store or to a pizza shop. Also, you’ll save lots of money making your own. You can get a lot of pizzas out of a bag of flour–especially if you buy a twenty-five- pound bag like I do. What else is nice about making homemade dough is the fact it’s practically indestructible. For example, you can make it in the morning and leave it growing practically most of the day without any problems. I have even stored my finished dough in the refrigerator after initially growing it and made it the next day when something unexpected turned up. As I was saying, homemade pizza dough is easy. Besides, you’ll feel better knowing there’s no preservatives or additives in homemade crust compared to what comes frozen in a box or a grocer’s shelf some wear. Here’s how I make it. Add half the sugar to your warm water, not hot water, stir trying to dissolve the yeast and let it sit in your mixing bowl until the yeast starts bubbling. When it has some foaming action, you’re ready to add the rest of the sugar, oil and flour. Add two cups of the flour at first. Stir with your wooden spoon. Add the rest of the flour gradually until the dough is no longer sticky. You want a soft, pliable ball–not a hard dense one. Sometimes, the weather changes how much flour you need to use. The trick for a soft dough that doesn’t stick to your fingers is adding flour slowly to your bowl. There have been days I used less in the same recipe or more. Your fingers will tell you how much extra or less flour you need. Let your dough rest and grow, covered for at least 1 hour to 1-1/2 hours. After that time, the dough should have grown slightly. Take that dough and put it in your greased baking pan and stretch to fit. Since I’m restricted to my big toaster-oven until my kitchen gets remodeled, I make two small pizzas out this recipe. The pans I use are 11-1/2″ x 8-1/2″ sizes. Pizza sauce is cheap in the big number 10 can at places like GFS (Gordon’s Food Service) Marketplace. I tried their own brand in that size for less than $3.00 and had lots more dinners out of it. Spaghetti sauce works just as nicely. Spread on as much as you need of your favorite sauce. Top with your favorite Mozzarella cheese and toppings of your choice. Bake at 450-degrees for 15-20 minutes.